Sequel To TWINS Finally Moving Forward | Birth.Movies.Death. If you were crushed when the film Junior failed to recapture the pure cinematic joy of Twins, take heart: a sequel is coming! Finally, the epic saga begun 24 years ago by Arnold Schwarzenegger, Danny Devito and Ivan Reitman can be concluded. And classic hijinks are sure to ensue as Vincent and Julius discover they have a third brother - played by...EDDIE MURPHY?!?! So get ready for Triplets, which doesn't seem to have a script or director yet (according to THR), but how can this team miss? Two of the biggest box office stars in the 80s, who probably had to beg Danny "working actor not in need of a major comeback" Devito to return, PLUS the producer of Shivers! * Money in the bank. 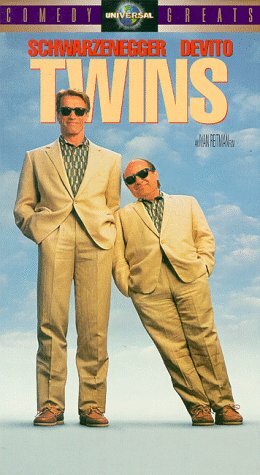 *Fun fact: In 1988, Ivan Reitman convinced his old pal David Cronenberg to give up the title Twins, which resulted in Cronenberg renaming HIS 1988 twin movie Dead Ringers.